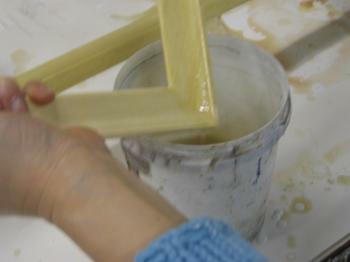 Gesso is used to prepare a ground for gilding. The first step is to size the frame with rabbit-skin glue to make it suitable to receive the gesso. The gesso, a mixture of rabbit-skin glue and whiting, is then applied to the frame in several coats to build up a smooth surface. This is sanded as smooth as possible with fine sandpaper. The gesso is next painted with bole, a clay based earth colour, and rubbed smooth with a burnishing brush. This provides a coloured ground on which to lay the gold leaf. Pet owners please note. Care should be taken with new freshly gilded frames as they may still retain the scent of rabbit-skin glue. One customer reported that she had left her new frame standing against a wall, only to later discover it badly licked and chewed. Unfortunately it had proved irresistible to her dog, a Golden Retriever!